I HADN’T been back to Hanoi in 20 years, so last January, when Beng and I thought of a place to visit for the summer on one of Cebu Pacific’s promotional fares, Hanoi was at the top of my list. 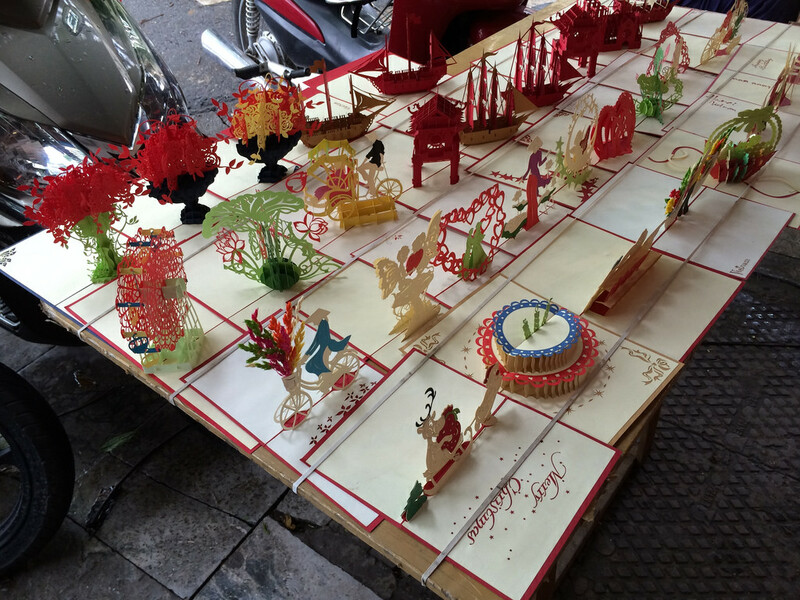 I’d taken Beng to Ho Chi Minh City a few years ago and we’d had a blast with the food, the history, and the shopping, so a northern sojourn seemed in order. Joining us on the trip last week were my niece Susie and her husband Toto, taking a break from their business chores and eager to be initiated into the cheap thrills of regional travel. When we arrived past midnight, rain was lashing the city, and the unseasonable weather persisted to the next day. For the rest of our four-day stay the sky was overcast, not altogether a bad thing, as we hardly sweated on our marathon walking tours. Few people realize how far north Hanoi is, as used as we are to thinking of Vietnam in terms of Saigon, nearly as low on the map as Davao. But Vietnam is a very long, thin country, and to fly the three hours from Manila to Hanoi is to actually fly northwest, practically toward China. 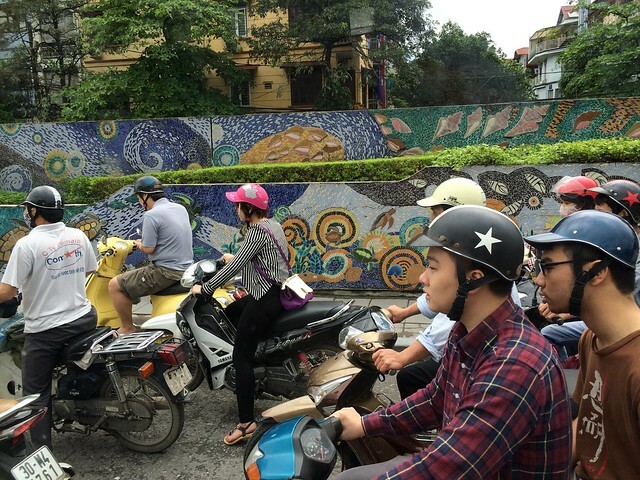 While HCMC—the old Saigon—might swelter in the heat, Hanoi is happily cooler. It’s also older, smaller, and quieter than its southern counterpart, which makes for more pleasant touring. At its core, the city is lived in by just around 2 million people, so it’s a city that can still boast of a lot of greenery and free space, with sidewalks wide enough to host the ubiquitous, low-slung food stalls that the Vietnamese would probably starve to death without. Few cities around the world can claim to be more than 1,000 years old, and that’s a milestone that Hanoi passed in 2010, to much fanfare. The event is still commemorated by a four-kilometer-long wall of mosaic art that runs along the city’s main avenue. Ranging in inspiration from Van Gogh’s “Starry Night” to comic-book art, the vibrant mural is free of any graffiti whatsoever. Paint, of course, would have a hard time sticking to the tiles, but perhaps more significantly, it’s a reminder of how strongly social order has been maintained by Vietnam’s political managers, despite its exuberant capitalism, manifest on every street and streetcorner, in the thousands of small shops that make up Hanoi’s Old Quarter. 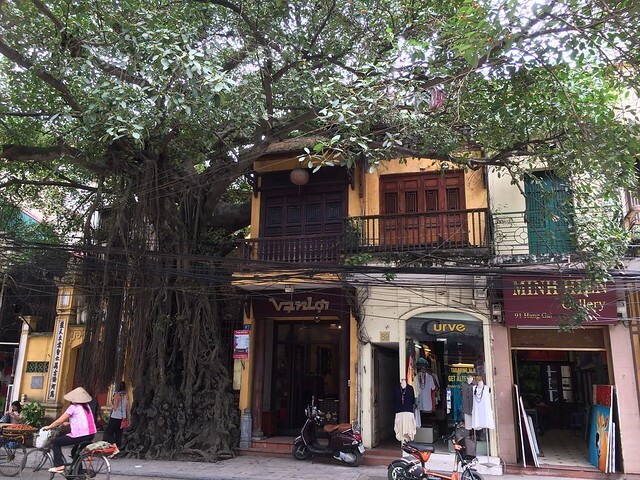 The charm of old Hanoi was in the fact that its traditional center—the “36 Streets District”—used to be devoted to guilds of craftsmen, with each guild occupying a street, the silk merchants here and the shoemakers there, and so on. Some of that remains—the silk shops and therefore Beng and Susie themselves were mostly to be found on Hang Gai street—but modernization, plastic, and mass production have inevitably worked their way into the Old Quarter, rendering swaths of it indistinguishable from other streets in Shanghai, Bangkok, and Kuala Lumpur. All these are signs of the energetic entrepreneurship that has swept up the Vietnamese; I read that almost 98 percent of businesses in Vietnam are small ones, and it did seem that nearly every Vietnamese person we met was a shopkeeper or a tradesman. “We work from 9 in the morning to 11 in the evening,” said one girl in a souvenir shop, in the same tone she would have used to talk about the weather. Speaking of shopping, any visitor to Vietnam quickly realizes that you become an instant millionaire the minute you exchange as little as US$50, which is equivalent to just over a million dong, or VND. (Toto devised an easy way to figure out how much things cost in pesos—drop the last three zeroes, then multiply the remaining number by two, so 400,000 dong is 800 pesos.) Costs have gone up a bit, but Tripadvisor recently still listed Hanoi as the world’s cheapest city for tourists: a one-night stay in a four-star hotel, and cocktails and dinner for two with wine plus taxi for two miles averaged just $141, compared to London’s $518. When I first visited Hanoi in 1994 with a small group of Filipino journalists and artists, we stayed in a hostel in an old French-colonial building; our room had a ceiling fan and a mosquito net, and it cost us all of $5 per day. This time (thanks to our daughter Demi’s employee discount) we were booked at the swanky Sheraton overlooking the West Lake, with free wifi and the kind of sumptuous breakfast buffet that you could just as well find in Hong Kong’s or Singapore’s best hotels. A leisurely walk along the nearby lakefront revealed that a robust industry had sprung up in the construction of modern “executive villas”, presumably for expats and managers. Every now and then a coffee shop broke the succession of leased apartments; Vietnam is one of the world’s largest producers and consumers of coffee, and Hanoi is dotted with virtual temples to the godly brew. Aside from coffee, the most popular drinks seemed to be fresh coconut water and the local Bia Noi beer—all of which, of course, we joyfully imbibed. Just as naturally, food is one of the best reasons for visiting Vietnam, and Hanoi did not fail to satisfy in this department, with rice noodles, spring rolls, roast pork, and fresh fruit topping the menu. But for all that they had to eat and drink, the Vietnamese we met remained slim and fit, ready for another long day’s work. Surely there must be poor and even very poor people in Vietnam—you just can’t find them on the streets of Hanoi; not once were we approached by a beggar or a street person; neither were the sellers as pushy with their wares as they might be elsewhere in many an Asian market. Come to think of it, we didn’t meet too many uniformed policemen, and no blue guards stood watch over stores and businesses. In the museums—such as the military memorial that impressed me the first time I saw it, with its display of scraps from fallen B-52s—grim reminders exist of the horrors of that terrible war by which alone many outsiders know Vietnam. Ho Chi Minh’s mausoleum—built in his honor against his express wishes—was closed the day we visited, but even among the milling crowds outside at Independence Park, the affection for the man was palpable; unlike Mao and Stalin, Ho was more a teacher and an uncle than a ruler or despot, and books of his poetry were still sold in the bookstores. Hanoi is a city of parks and lakes, the most famous of them being Hoan Kiem in the Old Quarter, its centerpiece a temple to which pilgrims cross over a red bridge; I daresay that no one visits Hanoi without having his or her picture taken on that bridge. 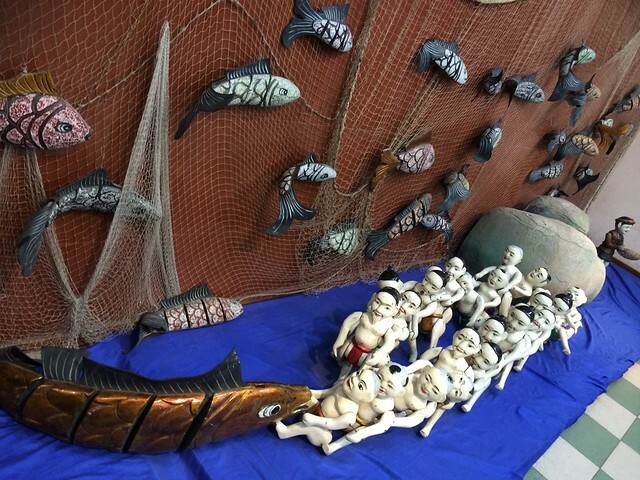 Nor will tourists miss the famous Water Puppet Theater in one corner of that lakeshore, a cultural institution that draws on the traditional affinity of the Vietnamese to the water, defined as the north and south are by the Red and Mekong Rivers. Playing for at least four one-hour shows every day, the theater was packed with tourists, each one paying just around 200 pesos for truly unique, ingenious, and wholesome entertainment. 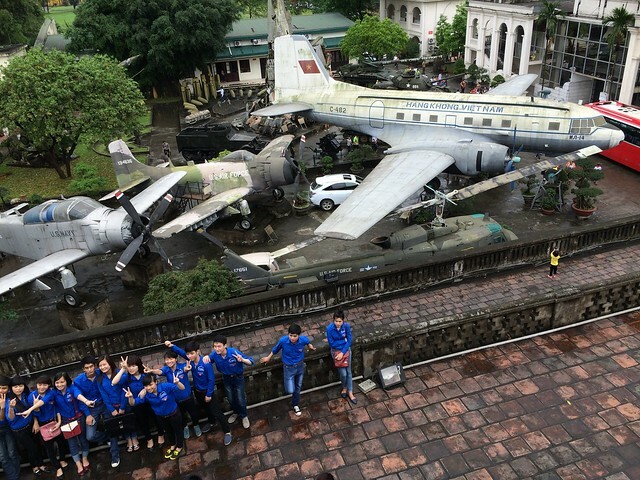 The smiles on our faces as we stepped out of that theater pretty much summed up our long Hanoi weekend, and over coffee in a park beside Hoan Kiem, the inevitable question came up: if the Vietnamese can do this for themselves, why can’t we? This entry was posted in Art & Culture, Friends, Fun, Travel and tagged Vietnam Hanoi travel by penmanila. Bookmark the permalink.